Wanda Coleman. 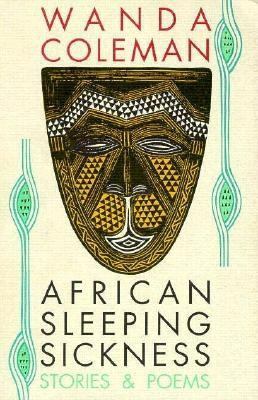 African Sleeping Sickness: Stories & Poems. 1990. Wanda Coleman died on the twenty-second of November. I’d been introduced to her work roughly a year ago and hadn’t been able to let go of her long poem, “African Sleeping Sickness.” Some months ago I found her email address and contacted her. She gave me this stunning poem, which Asymptote published in its annual English Poetry Feature. But that very brief, personal admission is followed by a response—the poem is structured as a dialog—written in an entirely different register: a less inward-looking voice, a voice that opens out to a world of small, happy objects: a voice seeking, offering a sad pleasure, one could say. The title of the poem is “Tremors & Tempests: A Poetic Dialog.” The shaking, the sign of future destruction or pleasure, the barely perceptible movement, and the storm—that’s how I read it. And it’s a useful way to characterize the various natures of speech as well, or what are privately known quantities and what is gathered from public witnessing. Then, how these speak to each other. LIES/ISLE. Issue 7. THE DESERT.